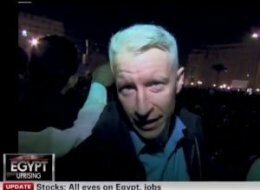 CNN reporter and anchor Anderson Cooper was attacked by the anti-government protesters in Cairo, Egypt. This seems to the first incident of a foreigner being attacked in Egypt’s anti-government protests. Cooper and his team were walking in Tahrir square through a large crowd of Mubarak supporters when the scene turned ugly. The crowd had let him walk for several minutes into the square when one man leaped out of the crowd, screaming, and attempted to grab the camera. When he then began to attack Cooper’s crew, people in the crowd began to join in, at which point the team decided to leave the square. They began walking away from the group who had begun the assault on them, but as they walked out of the square, various other groups rushed towards them, shouting, punching, and kicking the crew. In the video, crowds can be seen running towards Cooper’s team several times as they attempted to exit the square. When the team began to run, they were instructed by a few friendly Egyptians to walk, or else it would be interpreted as encouragement to the violent crowd. Once they had escaped to safety, Cooper reported that aside from kicking and punching the crew, the crowd had thrown bottles, bloodied the camera operator’s eye, and tried to rip a female crew member’s clothes off. Now it seems apparent that the the target was indeed the journalists. According to MSNBC’s Richard Engle and Al Jezeera, other journalists were attacked similarly during the day. Since then, Tahrir Square has become the site of bloody clashes, largely instigated by pro-Mubarak protesters, some of them police in disguise. Reports of heavy machine gun fire and tanks laying down smoke screens turned downtown Cairo into a war zone. Reuters reports four dead and more than 1,500 wounded as the violence continues. No word on whether Cooper and his team will heed their advice. You can watch the video of the attack in CNN.com, click to watch. Arafat's Body to be Tested for Radioactive Poisoning! Next: Obama Triggers Blackouts ?